Mama C is mobile catering company in Sussex, serving delicious, homecook, British food from our beloved Airstream. Wishing to get back to full time catering, a plan was hatched around the iconic Airstream, polished to a mirror shine and fitted out with fairy and LED lights to extenuated the Airstreams beautiful curves. The Airstream is called Nuala, the sun gleams off of her. We aim to create a relaxed, carefree, fun, welcoming atmosphere and above all delicious, locally sourced foods. The Airstream offers an original, beautiful, eye-catching spectacle that your guests will enjoy and remember for years to come. 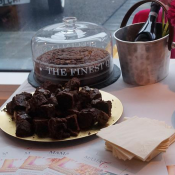 Mama C can tailor to your requirements for food and drink, specialising in Traditional English Homemade Comfort Food such as Giant Pork Pies, Breakfast Pies, Gourmet Burgers, BBQ Ribs, Banoffee Pie, Eton Mess and our luxury, to-die-for Brownies. We’ve also designed our own special, unique treats: Ice Cream Burgers – Brioche buns and homemade ice-cream. Homemade Pastry with succulent cuts of meat and other delicious fillings. 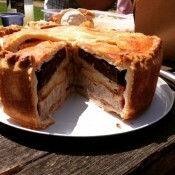 Giant Pork Pies, Breakfast Pies and more. 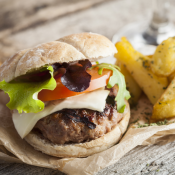 Our burgers are 100% british beef, sourced locally and served in a bun with fresh salad, homemade relish and cheese. A crowd-pleaser! Our banoffee pie is pure indulgence. 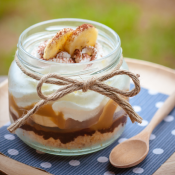 Delicious biscuit-base with smooth caramel, topped with bananas and whipped cream. Worlds best brownies pretty much guaranteed. Delicious, gooey, rich chocolate. Total indulgence! Mama C would love to hear from you. If you have an event coming up that requires a full catering service within East Sussex, please contact us via the details above or via this contact form.